Another day in paradise…well, we think Florida qualifies for that title. 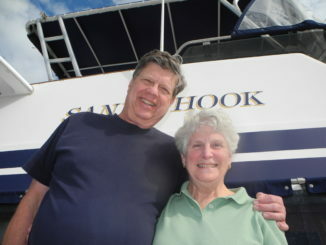 We are ready for a two-day Trawler Training trip aboard Sandy Hook with Claudia and Ken of Phoenix, AZ and Christine Alhambra, Managing Editor of Passagemaker Magazine. Welcome aboard hors d’oeuvres and an air conditioned saloon are set for our afternoon arrivals. You know what they say about schedules on a boat? Everyone does NOT arrive as planned thanks to planes, trains and automobiles that don’t cooperate. But that’s OK; Years of cruising experience teach us to ride the waves as they come. 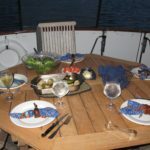 Early in the evening Christine boards and we enjoy a sultry sunset and dinner outside on the aft deck. The requisite orientation and security review will just have to occur twice this trip. 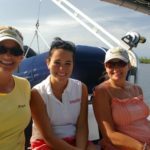 Phone calls, texts and emails from Europe then Chicago Midway let us know our training couple is truly on their way…don’t forget to scroll down for a photo journal of this fun trawler training trip. Although our guests didn’t plan to come aboard after 2 a.m., we are glad they are such seasoned travelers and know how to adapt. 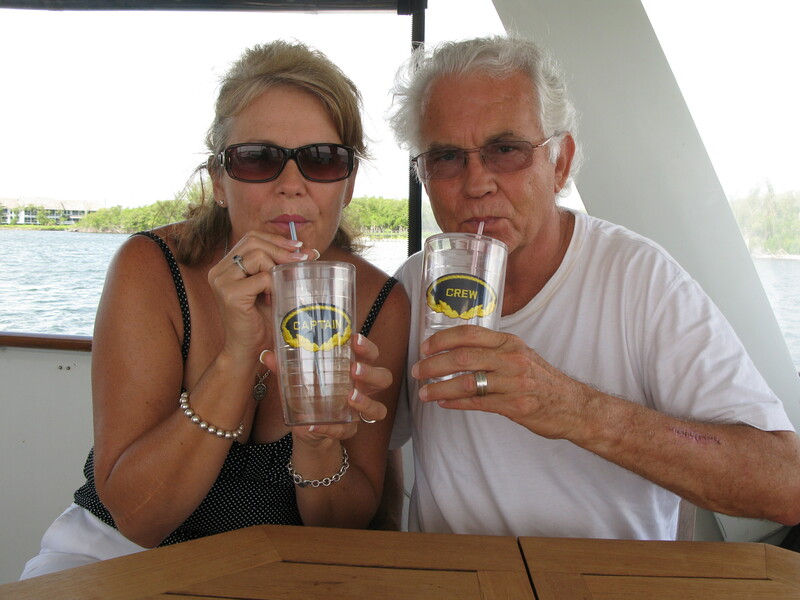 Flexibility is an important quality for cruisers to have and Claudia and Ken have a great start to their adventure. We tuck our weary globe trotters into the Master Stateroom and get a few more winks of sleep before the official start of Day One. Cruising goals are different for each couple and it’s important to understand and respect these differences. 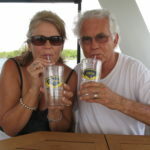 This soon-to-be cruising couple, like many we meet, has a disparity of experience in boating. 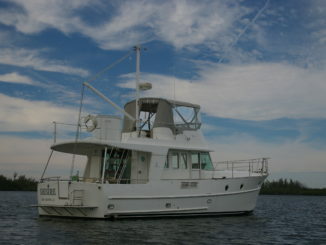 Ken has owned boats before and can draw on his previous years of time on the water. Claudia is skilled in CRUISE ship etiquette but is an eager learner and catches on quickly. So we start with lots of discussion about their cruising aspirations over a yummy breakfast, reviewing the basics of navigation. 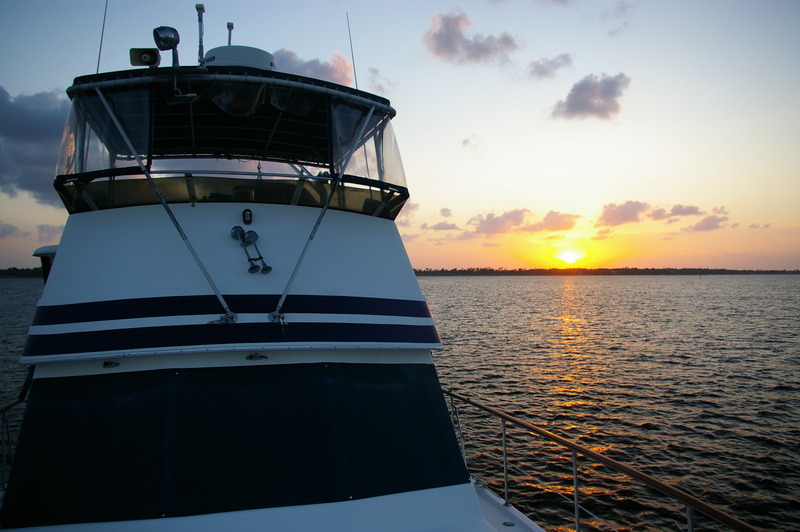 Using traditional charts we cover the local area, inlets, the Atlantic Ocean and Intracoastal Waterway. 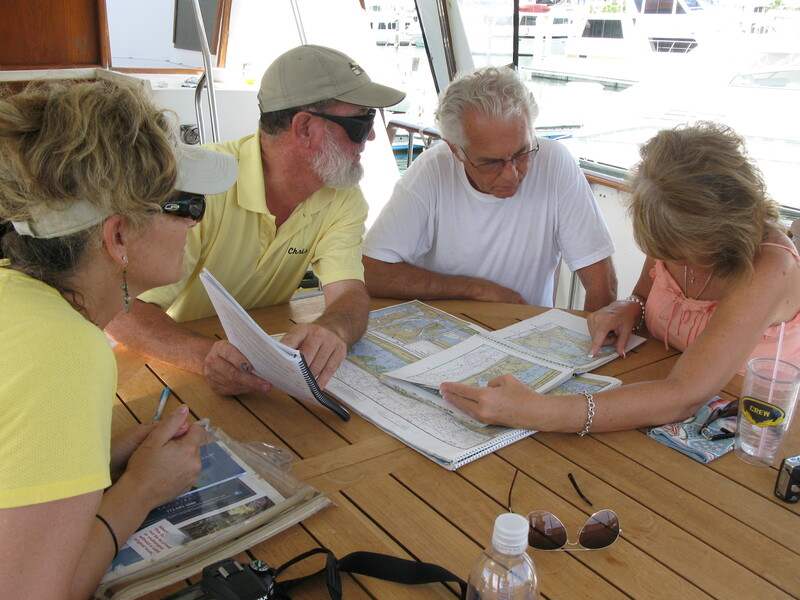 Next we touch on trip planning with anchorages and marinas including using Cruising Guides and Skipper Bob’s Anchor guide. As we will soon begin our journey south, we also illustrate the advantage of using the ICW “flip chart” by Kettlewell. 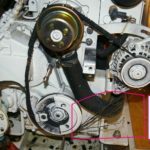 A fundamental assessment of the ship’s systems and safety equipment always precede engine start up. 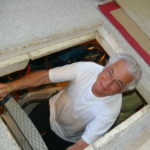 You may not be an expert mechanic but a prepared captain and crew are familiar with what’s below the deck and can make basic assessments- fluid levels, sea strainers and a few spare filters, belts etc just in case. 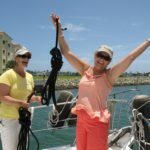 Then we review docking essentials and Captain and Mate are in agreement for our cast off. One long and three short blasts on the ships whistle as we back out of our slip. We’re off! 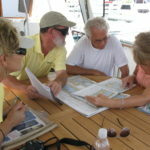 Navigation 101 begins. It’s time to put actions to what we’ve discussed. 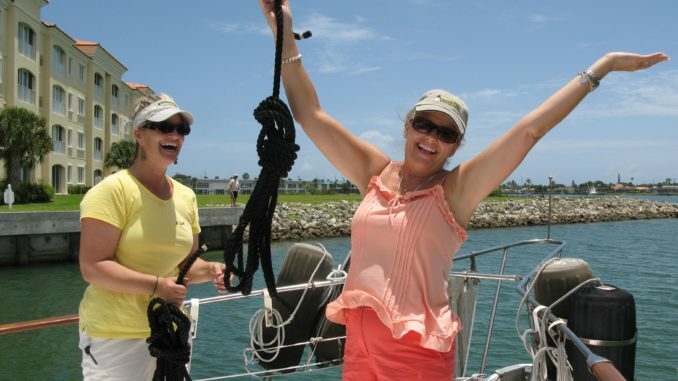 A short tour out the Fort Pierce Inlet allows us to see how to use a Range Marker system. This system helps big ships and little yachts like us to stay on course in an important channel. We return to the ICW noting the yellow reflector stickers marking the difference between an ICW NavAid and an ordinary NavAid. Cruising south we get to play with our instruments. Guitar? Trombone? Tuba? Not today…but while musical instruments can be fun at sea, right now we are more interested in navigational instruments. The depth gauge is crucial in this part of the ICW so we can find the deep water. The SE wind is blowing a steady 15 knots and could easily push us out of the channel into the shallow water if we don’t pay attention. Life happens FAST at 7 knots. A few other electronic navigation instruments such as radar, GPS charting and VHF-FM DSC radios keep our concentration focused throughout our journey. But, let’s not forget the old reliable magnetic compass which requires no electricity. Dead reckoning includes the magnetic compass in conjunction with spotted landmarks like overhead power cables, water tanks, radio towers and bridges. We work a bit on situational awareness to help navigate safely, too. Nearing Stuart, FL we come upon “The Crossroads”, the intersection where you can make the decision to head West across the Okeechobee Waterway (OWW) to Fort Myers and the Gulf of Mexico, or East to the Bahamas across the Gulf stream or South to Palm Beach, Fort Lauderdale, Miami and the FL Keys. 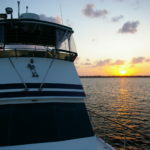 Our final destination for our night at anchor is Peck Lake where we launch the dinghy and putt-putt to the barrier island. A short walk through the mangroves to the ocean before sunset is a bonus. Sea turtle nests are marked out by park rangers and can be seen up and down the beach. 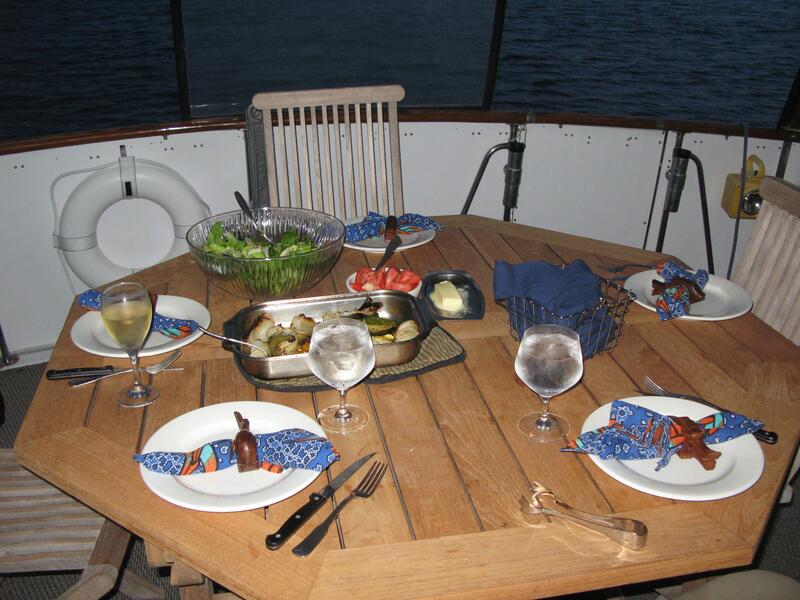 Back aboard Sandy Hook we BBQ steaks, watching the moon rise before reviewing the events of the day. We set up an anchor watch using GPS and identify nighttime landmarks for visual reference in case the wind or tide turns the boat. All is well and we head to our staterooms for a good night’s rest. It’s o’dark thirty and the generator stops. With an eerie silence we realize that, even worse, the air conditioners QUIT. Part of our training program aboard Sandy Hook is to be prepared, have spare parts handy and have you learn basic maintenance. 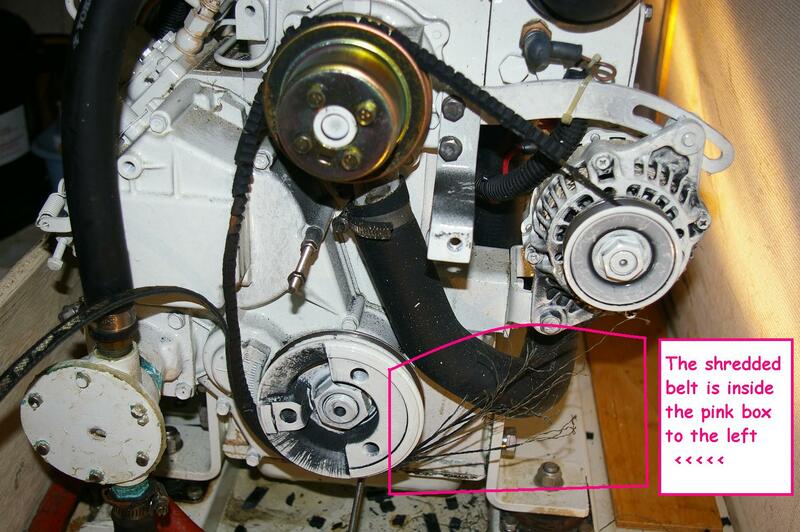 A quick assessment reveals a popped fan belt for the recirculating pump on the generator. An easy fix and fifteen minutes later we have cool air in abundance. MMmmm. Back to sleep to wake up at a decent hour…maybe sunrise? After Breakfast in a Bucket (see our recipe section for this quick and yummy dish) we jump in the dinghy and head for the beach one more time. This morning we spy 5 new sets of tracks where momma turtles crawl up the beach, lay eggs then cover them with sand. 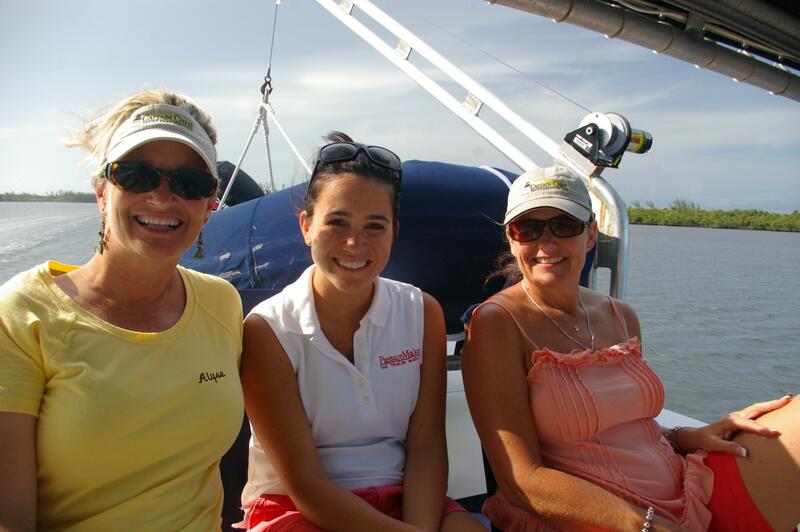 Cruising adventures surely bring you back to the basics of nature. 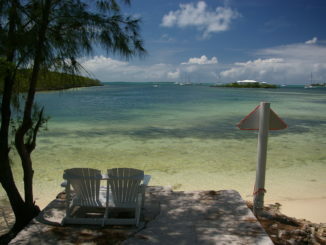 Would you ever expect to see a turtle nesting area just minutes from civilization? Using the paper charts we calculate our arrival time at our home dock. Ready to haul the anchor? 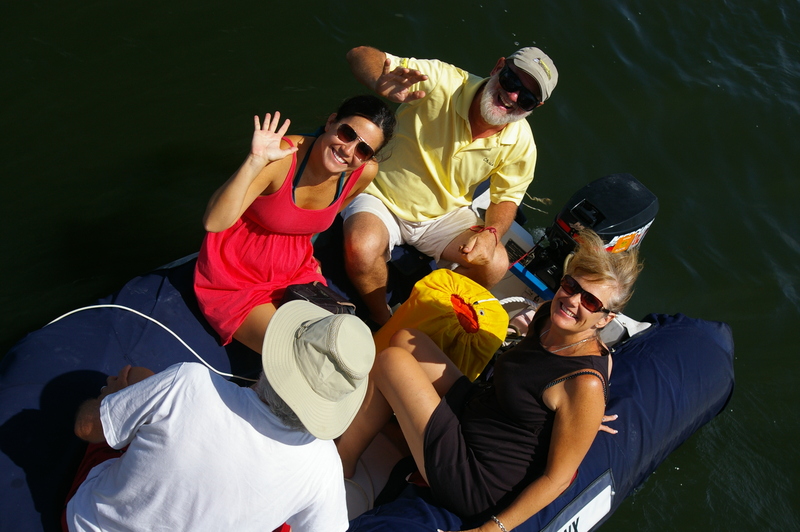 Ken is at the bow using hand signals while Claudia takes the helm and maneuvers the boat toward the anchor. The capstan/windless retrieves the rode and chain. Our anchor held the boat so well during the night that we have a little difficulty getting the bottom to release the anchor. Uh-oh. Lots of mud is coming up. Get the bucket to rinse the decks. Our trip home allows for review of navigation, whistle signals and VHF radio procedures including Mayday, Pan-Pan & Security. As we near Fort Pierce we pay close attention to the water swirling around the NavAid pilings checking the direction and velocity of the tidal current. This helps us to plan our turn into the marina channel. But the outgoing tide is fierce and it pulls us off track when lining up on the channel. 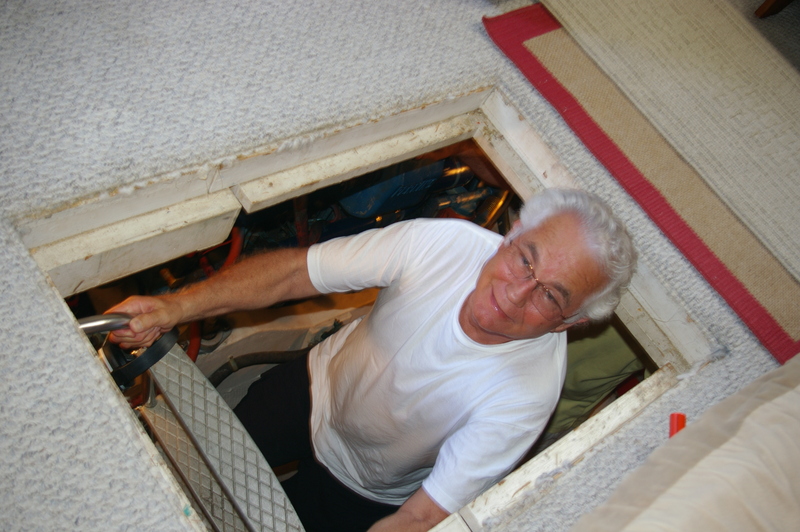 We do some quick steering corrections to maintain course and finally enter the marina basin and ease into the slip. So much is learned in this two day adventure. 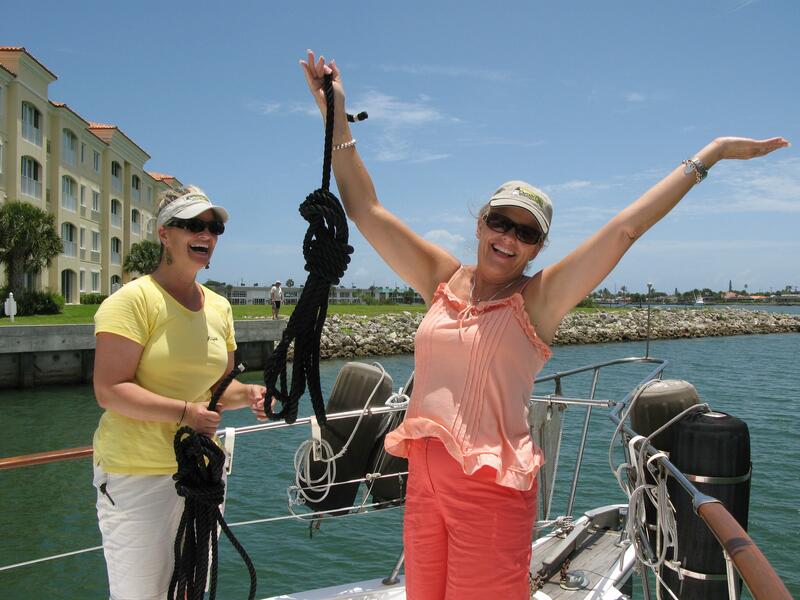 Tomorrow Ken and Claudia will be back in their southwest home and Christine will be diligent at her desk at PassageMaker Magazine preparing for the next TrawlerFest… Yes, it is a Bon Voyage!